His name is Maturu Phalguna Rao. He hails from a very remote village in India, Mamidipalli. He is only 26 years in age. He has his name etched in the Guinness book of world records! On August 21st 2003, He embarked on a mission that required great confidence and and determination. His aim was to give the longest lecture in the world. The earlier record was by an American who lectured for 51 hours 44 minutes and 17 seconds…. On that day, there were thousands of witnesses , a team from the Guinness book firm, and 20 professors watching this young guy. He was to be allowed only a 15 minute break every 8 hours! Phalguna Rao started his lecture with a confident look, on 21st August at 11.45 am. On and on he went …stopping for just 10 minutes every 8 hours to pop in some glucose and a few apple slices…. Lectures, any student will tell you, are usually long….but this one was the mother of all lectures…..it stretched for sixty hours! Yes, Phalguna Rao lectured on computer fundamentals for a continuous 60 hours non stop! The lecture ended on the 23rd of August 2003 at 11.46 pm! He had set a new world record! 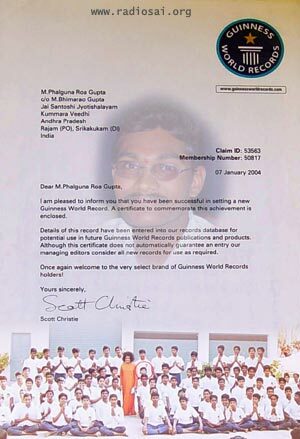 His name found a place in the famous Guinness book of world records! Ask Phalguna Rao , the secret of his strength and success and he remembers Bhagavan Sri Satya Sai Baba with gratitude. He says he derived this confidence when he was a student in the Sri Satya Sai Gurukulam , at Rajahmundry, from the sixth to the tenth standard. The discipline, the education and encouragement he received there had a major role in shaping his ‘never say die’ attitude. The highlight of his stay at the gurukul were the trips to Prasanthi Nilayam when Swami would pour His love on them. At this point, Phalguna Rao takes out the cherished group photograph that Swami had taken with his class and shows it to us with pride. “ Just before the lecture, I had a lot of cough troubling me…I prayed to Swami and started the lecture. For the next sixty hours the cough just disappeared….I believe this is His grace!”, he says. Hmm, a noble aspiration indeed! Heart to Heart wishes Phalguna Rao all the best in his aspirations! So, young brothers and sisters, this is what self confidence coupled with Divine Grace can do to anyone. That includes you too! !